An event for kids aged 6-12 and their parents. What will the view from your window look like in 50 years? 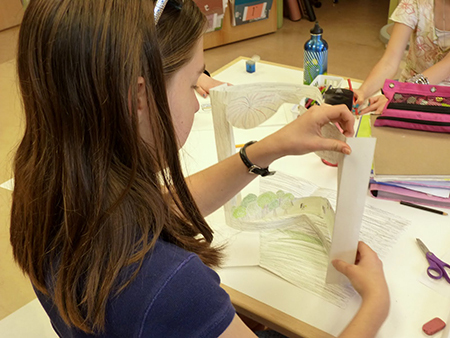 In this family workshop, we will be creating tunnel books—or dioramas that fold flat. Children will be asked to imagine looking out a window in the future. We will then use collage materials to create miniature models of the worlds they’ve envisioned. Feel free to drop in anytime between noon and 3 – participants can pick up as they arrive. All materials are provided and you are encouraged to take your creations home! Spaces are limited, so be sure to sign up early! Angela Kramer is a history and arts educator who has developed children's programs for museums and historic sites. She recently moved from Brooklyn to Maryland, where she has begun a new venture, Chipmunk Industries.